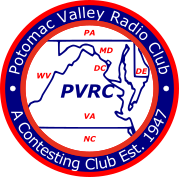 PVRC is a regional amateur radio club devoted to excellence in the competitive aspects of ham radio, particularly contesting. Currently, the club has over 750 members, of whom over 500 live within the 175-mile radius that ARRL and CQ have decreed or eligibility to participate in club competition in the 14 contests they sponsor each year that have that category. PVRC places high nationally in all of these contests, and wins at least one or two nearly every year. Click here for a list with chapter chairmen's names and contact information. If you know a PVRC member's call or name, or want to know who lives near you, click here for a searchable membership roster. An on-line membership form is here. Fill it in and we'll contact you. Once you are a member, please reference the PVRC faq for information on subscribing to our reflector(s). The only requirement for membership is an amateur radio license (any class) and an active interest in contesting. It doesn't matter whether you have your own station, or how elaborate it is. It doesn't matter whether your interest is HF, or VHF, or you don't even know yet. competitions. Your local chapter chairman can confirm that your QTH is inside the radius. Otherwise, the situation is pretty simple. You need to attend two meetings to become a member. There are no dues for PVRC, except by voluntary donation. Instead, we think your "dues" should be the submission of scores for the club in 2 (hopefully more) of the contests we enter as a club every year. If you can't operate from home, we'll be glad to help you line up an opportunity to operate, either as part of a team at a multi-operator station or as a "guest op" at a member's station. PVRC members help each other with antenna work, with technical issues, and with operating skill development. Learn how to contest with PVRC, and you'll have the satisfaction of watching your skills (and your scores) grow year by year. Some people tend to think of PVRC as composed entirely of "big guns." Nothing could be further from the truth. In fact, the average PVRC member's station probably consists of a transceiver, a tribander, and wires for 40 and 80 meters, on a city lot. some of our members even operate in contests with indoor antennas and QRP power. So c'mon, join the fun!